I will be participating in a panel, at an event organised by the Royal Institute of International Affairs, aka Chatham House. 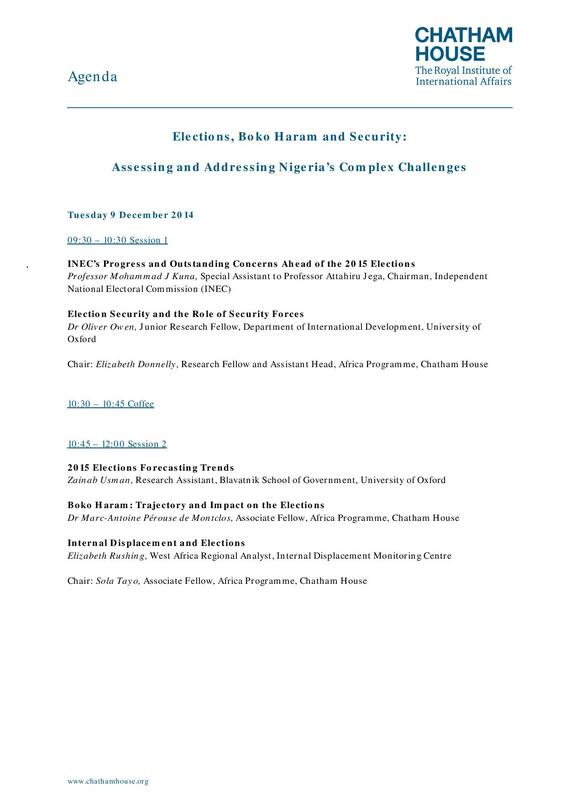 The title is: Elections, Boko Haram and Security: Assessing and Addressing Nigeria’s Complex Challenges. It is taking place at Chatham House offices in London, on 9 December 2014, from 9.30 am to 12 noon GMT. I will be speaking on the political landscape, the context, the key actors and forecasts of the possible outcomes of the 2015 elections in Nigeria. This will be largely based on the ongoing elections forecasts by my colleague, Olly Owen and I. The event will be live streamed, and will be made available from 9:30 on the Chatham House website. Nigeria faces multiple challenges, ranging from the increasingly entrenched conflict and terrorist threat from Boko Haram in the northeast, to economic impacts of declining oil prices. Added to this, what may be the country’s most competitive and contentious elections yet will take place in February 2015, with recent violence at the national assembly a possible sign of things to come. This event will discuss Nigeria’s upcoming elections, the influence different factors and actors may have on the process, with particular focus on security, and the opportunities for supporting a peaceful and credible process. What an excellent speech … I like it so much, and would like urge you to keep up doing it well. More grease to your shoulders. Best regards. Hmm may the skies be your limit, Pray Allah to continue to guide, protect and grant you more wisdom, good health and prosperity.